At the time of writing, there are an astonishing 291 different constructors of 500s listed on the 500 Owners’s Association website, and they are still researching them! 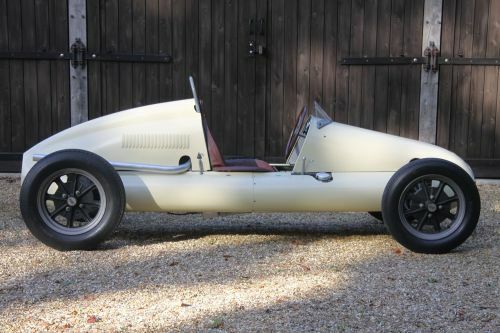 There can be none with a more striking history than this Cooper offered for sale. 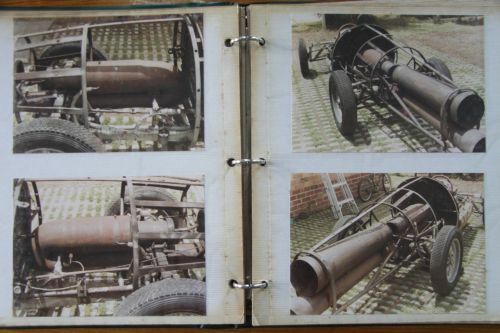 In 2015 this Formula 3 Cooper ‘Pulse Jet car’ was purchased from its long term owner in New Zealand and repatriated to the UK. 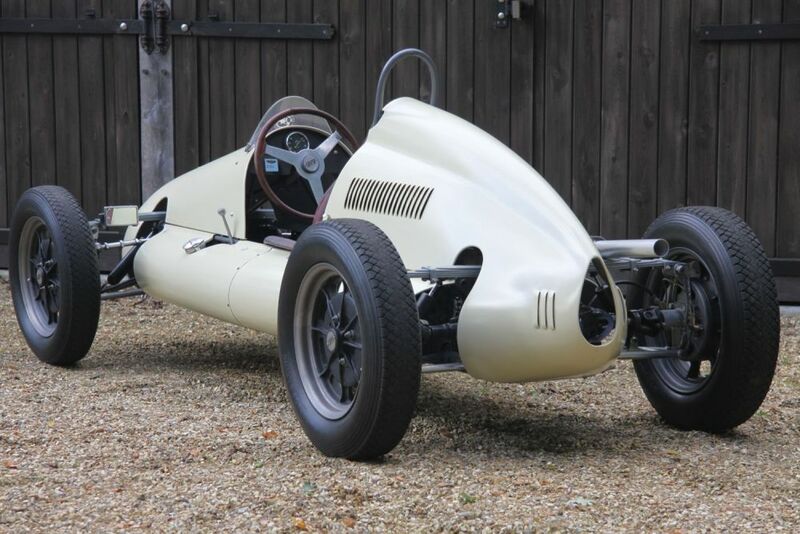 Cooper 500, chassis number MkV/12/51 was built in 1951 by the Cooper Car Co, 243 Ewell Road, Surbiton, Surrey, to the order of Derek Annable, a Buckinghamshire farmer. 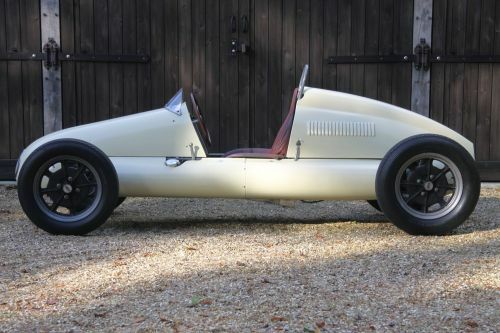 He requested the finish to be in cream with red upholstery, to match his mother’s Bentley, which was probably his tow car. 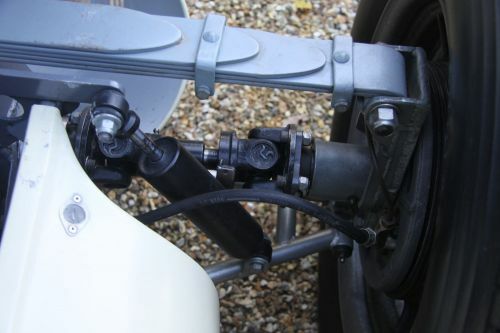 He also ordered a set of Norton engine mounts. In the early 1950s Derek Annable raced and travelled with Stirling Moss. As Moss was the star he often used Annable’s cars, but it is not certain that Moss raced this car. The Autocar of 28 September 1951 records Derek Annable with two 3rd places and one 5th place at the Half-Litre Club’s race meeting at Brands Hatch. In the final of the Open Challenge, Annable came 3rd, but only after “the worst accident yet to occur at the Kentish track”. 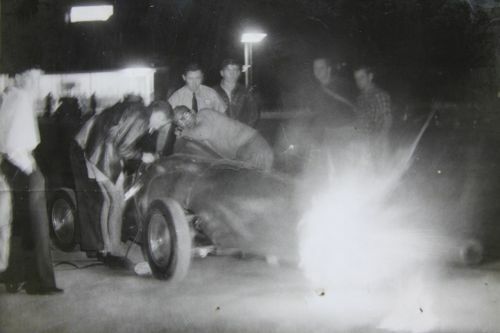 Battling for the lead, 21 year old Bernie Ecclestone in his Cooper 500 was involved in a collision with Loen’s JBS. 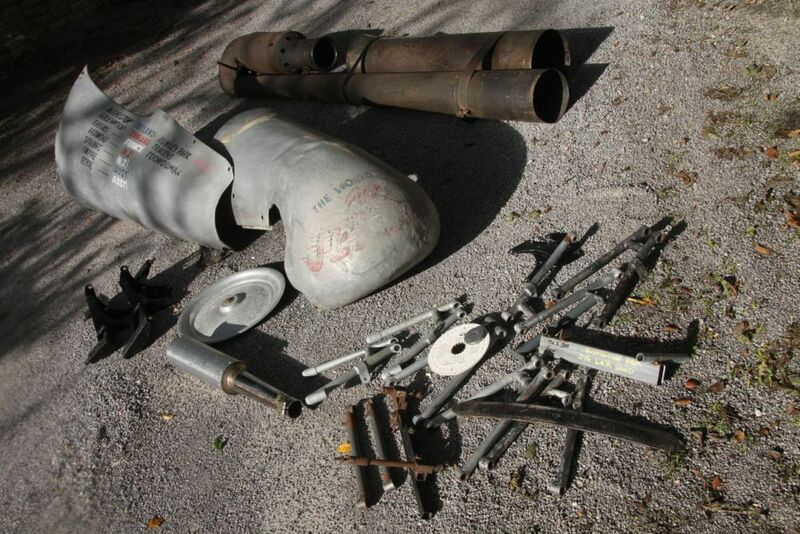 Ecclestone shot through a fence and into a spectator who fractured a thigh. Bernie Ecclestone was badly shaken and retired. 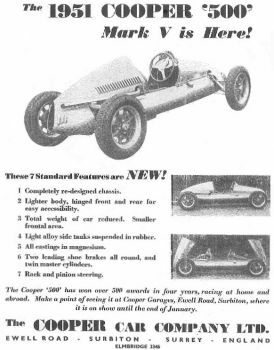 Advertised in The Autocar on April 4th 1952, ownership passed to Jim Miekle in Ireland who initially made the car available to the trainee race driving school at Kirkistown. 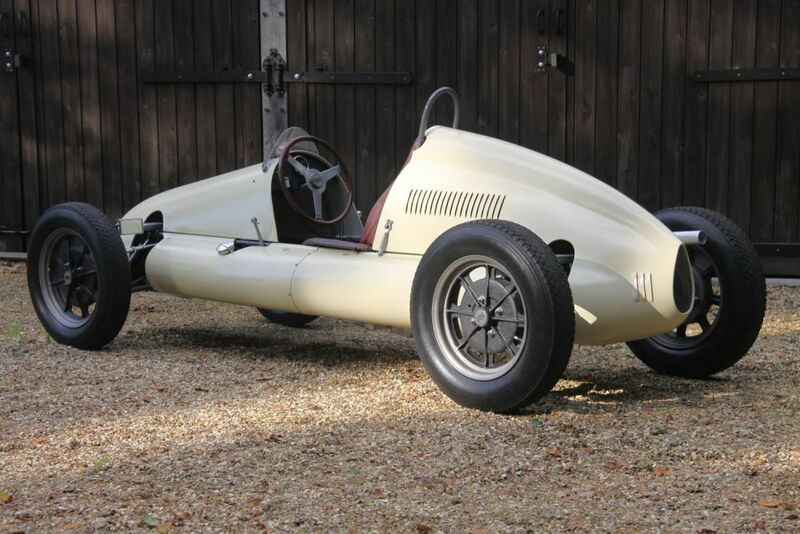 As an aside here, during 1952 Derek Annable ordered a new Kieft 500 which was subsequently borrowed and used by Stirling Moss to win the British Grand Prix at Silverstone. 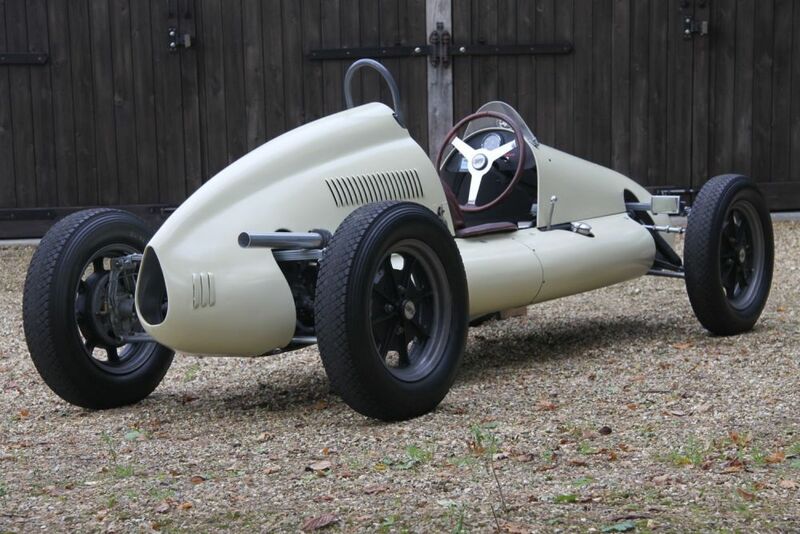 Derek Annable also bought another MkV Cooper for Ken Gregory, Moss's manager. Jim Miekle was proprietor of the Irish tapestry company, South Street, Newtownards, Belfast. 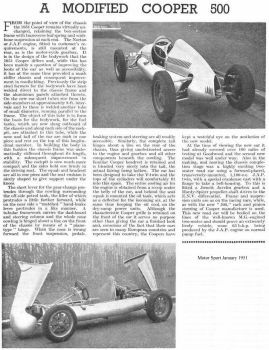 After loan of MkV/12/51 to the driving school, Miekle fitted a Ford engine to meet the specifications of the Irish 1172cc Formula and named the car 'The Slug' and went racing. 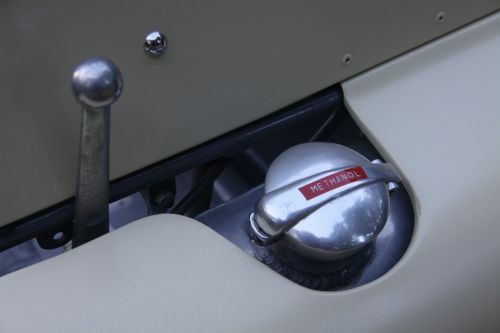 The water pipe fitting is still at the base of the rollover bar. 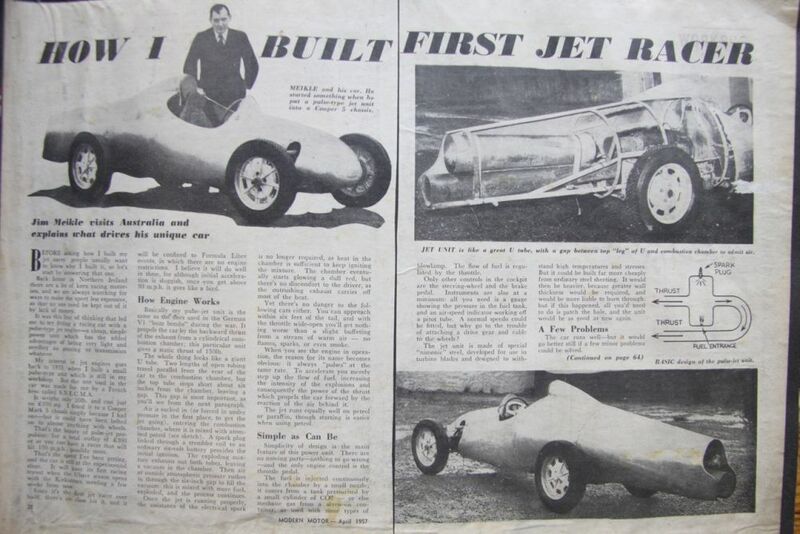 In 1955–56 or thereabouts Jim Meikle embarked on the Pulse Jet programme. 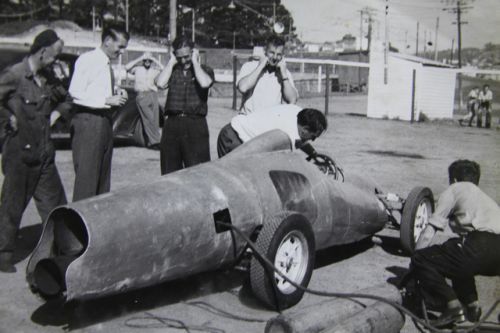 He fitted a SNECMA pulse jet engine to the chassis and radically altered the bodywork. The car was demonstrated in this form at Kirkiston in 1958, Rheims and Goodwood before being shipped to the Irish tapestry company’s New Zealand subsidiary, Manukau Road, Pukekohe, South Auckland. 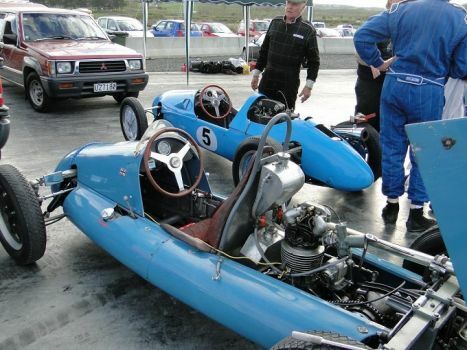 Pukekohe was also the home of the New Zealand international Grand Prix meetings from 1963 until the late 1990s. 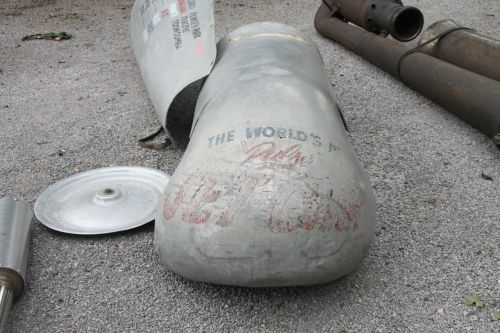 The noise of the jet engine could sometimes be heard 10 miles away – it was truly deafening. Visitors to see the car performing were told to bring earplugs. The pulse jet, similar to those used to launch satellites and the V1 Doodlebug bomb, was powered by benzine and compressed air. Such was the heat generated, it was necessary to find an alloy for the bodywork that would withstand the intense heat and 30 foot flames emitting from the back end. Help was at hand though from two French guided missile engineers… Carrying 5 gallons of benzine, this was burnt at the rate of 2 gallons per minute. 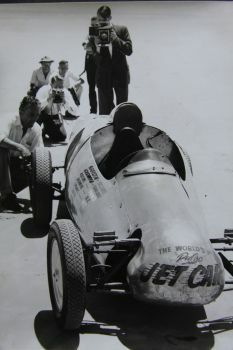 In 1960 ownership passed to ‘Cocky’ Cormack who was promoter at Western Springs Speedway. 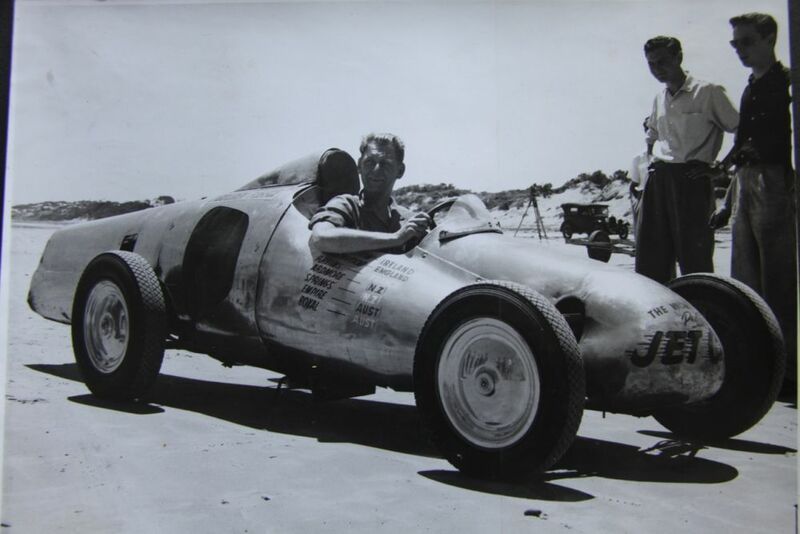 It is believed that Gil Nichols leased the car from Cormack and toured Australian speedway circuits to demonstrate the car, with sponsorship from Golden Fleece Petroleum. 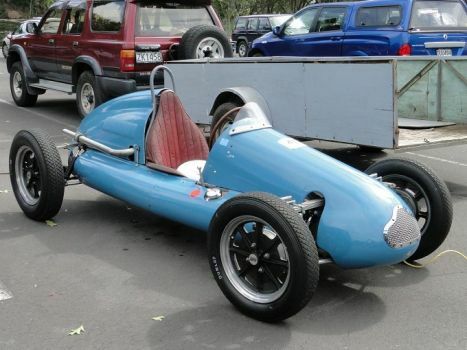 On its return from Australia to New Zealand the car was stored for 10 years or more in an Auckland warehouse, still on its Irish-built trailer before being bought in 1981 by Grant Cowie of Christchurch, NZ. 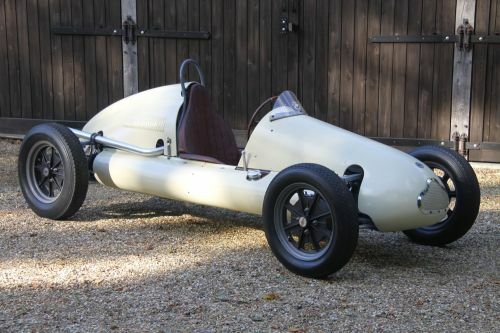 At that time however, Cowie had also been offered a car he had really wanted for some time - one of the Works Austin 7 'Duck' Racers - and so the Cooper was sold. Ian and Bev Garmey bought this ‘Pulse Jet’ Cooper 500 MkV/12/51 in 1981 and returned it to Auckland where a full rebuild back to its original Formula 3 Cooper 500 specification was carried out. 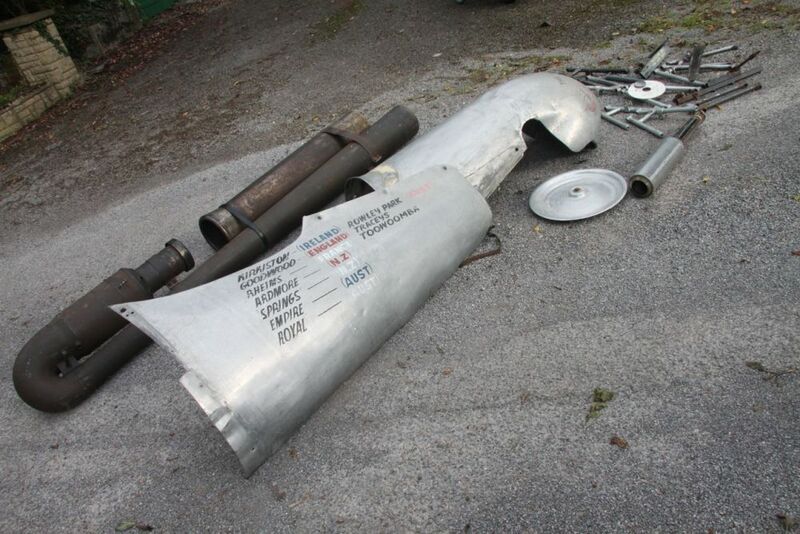 Much of the fabricated body simply disintegrated when removed from the chassis. 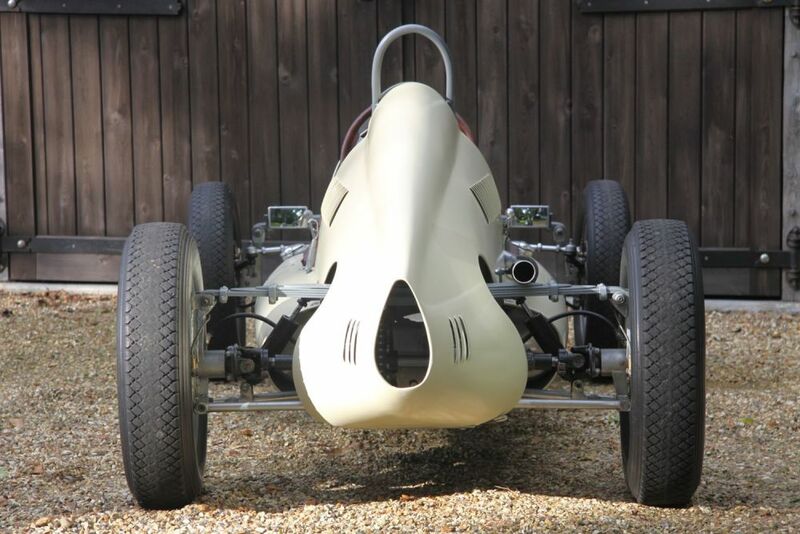 Only the car’s original nose had been used for the Pulse Jet Car – but even this had age-hardened and was only useful to use as a nose pattern for the new aluminium body. 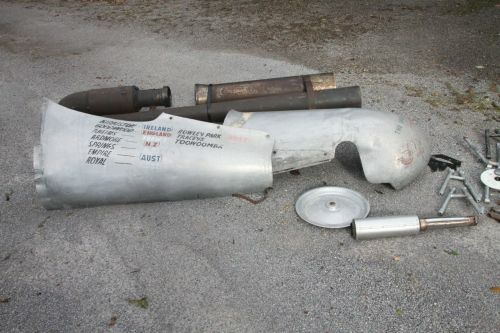 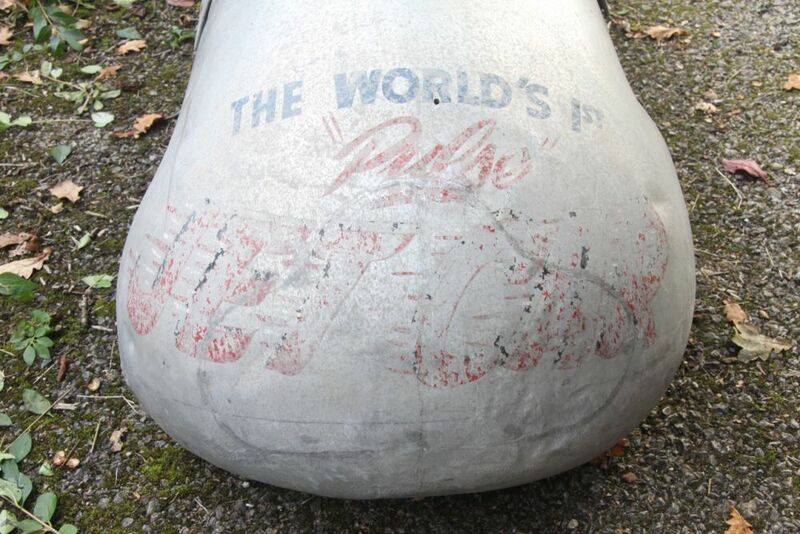 Today the SNECMA pulse jet engine and salvaged nose & side panels remain with the car. 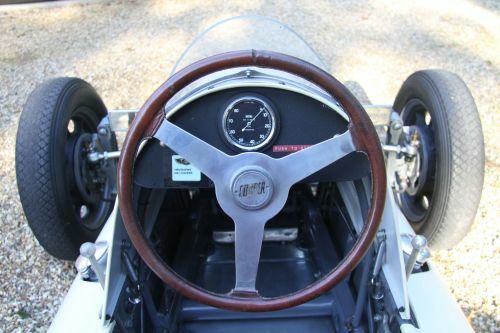 A JAP engine and Norton gearbox were sourced and fitted to the car in its current form. 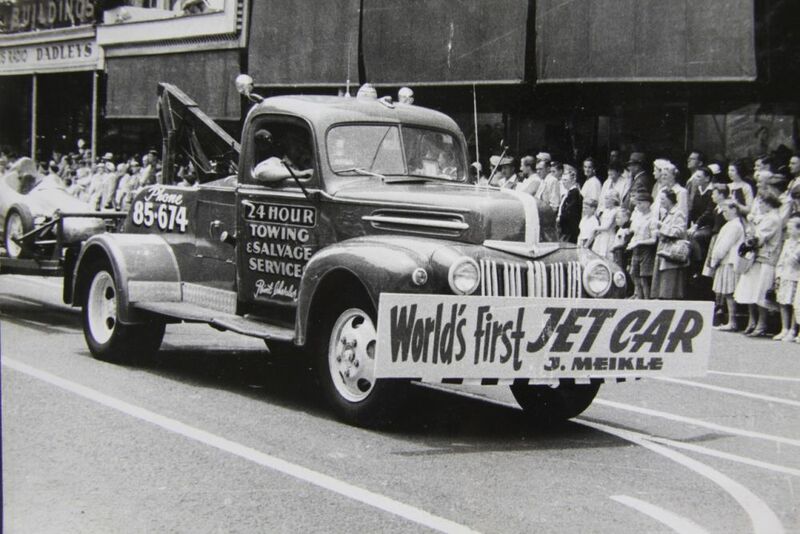 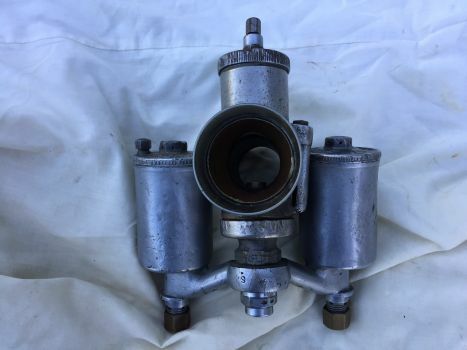 Using another Auckland car as a pattern, a new driveline was made by an engineering shop which occupied the original Irish Tapestry Company’s building in Pukekohe – the very building Jim Meikle nearly burnt down with the jet engine. 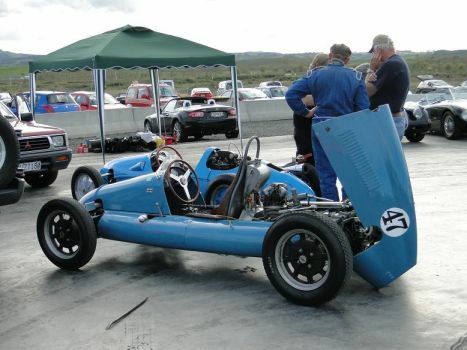 In the 34 years that this Cooper Jap MkV/12/51 was owned & raced by the Garmeys from 1981 until 2013, contact & communication has also been made with the original owner, Derek Annable, now a resident of Gambia and Wales; also George Meikle, the only son of Jim and Yvonne Meikle in Brisbane, Australia; Mrs D Meikle, widow of Eric – Jim’s brother and sometime driver of Jim’s cars. A detailed photo album of correspondence and press cuttings accompanies the car. MkV/12/51 also provided young Tony Garmey with his first competition drive, going on to become Auckland Formula Ford champion and also runner up in the New Zealand Formula Ford Championship – and now races historic GT and Can-Am cars for clients in the USA. 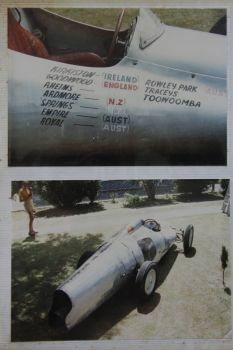 In 1987 Sir Stirling Moss visited Auckland – and along with the late Chris Amon met up with MkV/12/51. 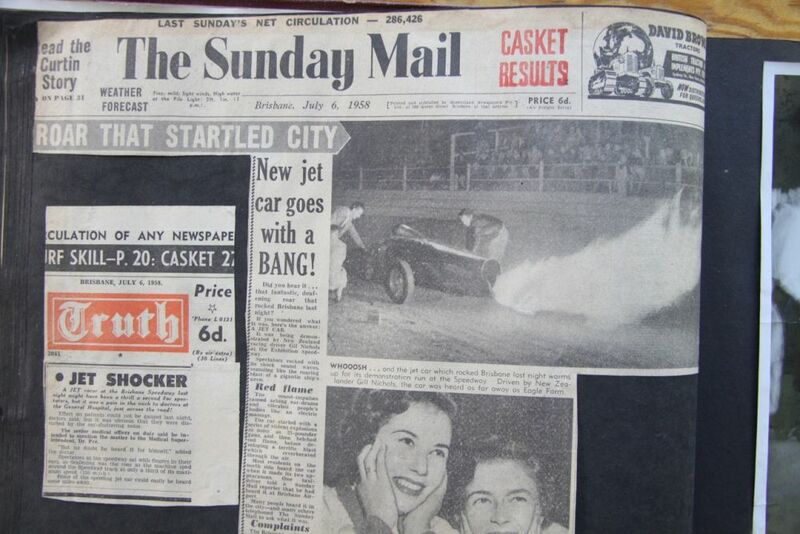 The press made a great occasion of this occasion and there is a signed framed photo of Moss sitting in the car on file. 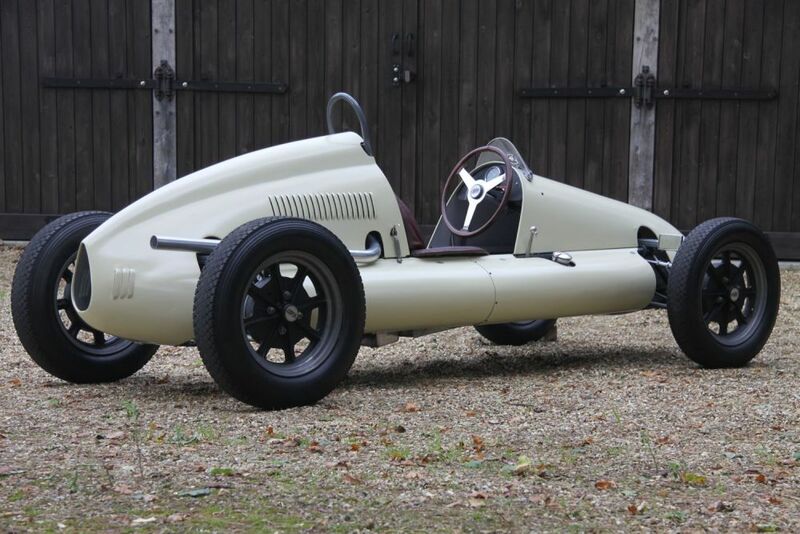 In 2013 this car underwent a complete restoration by Ian Garmey before he sold the car back to the UK in April 2015, including new panels, an engine rebuild, use of the original seat – MkV/12/51 is also now back in the original cream paintwork. 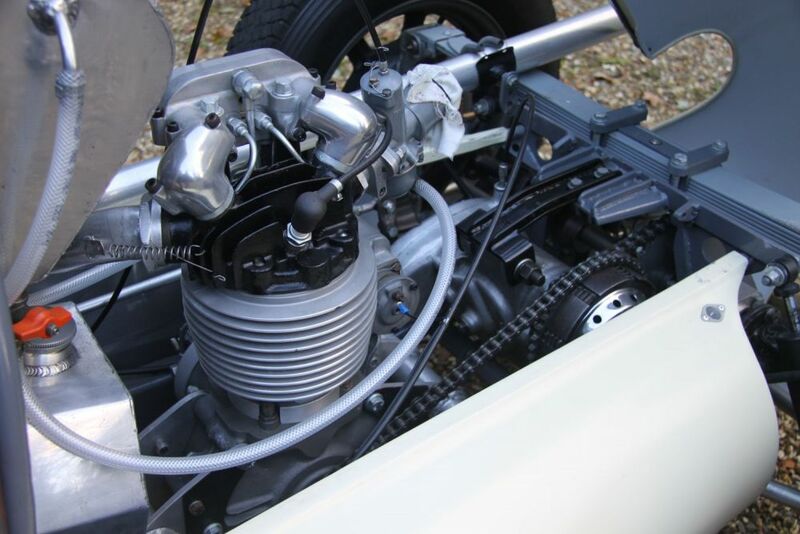 At present the rebuilt engine has zero hours and comes with the correct double float Amal carburetor and new silencer to comply with UK circuit, sprint and hillclimb rules. 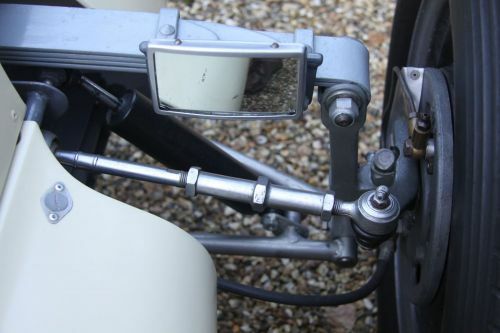 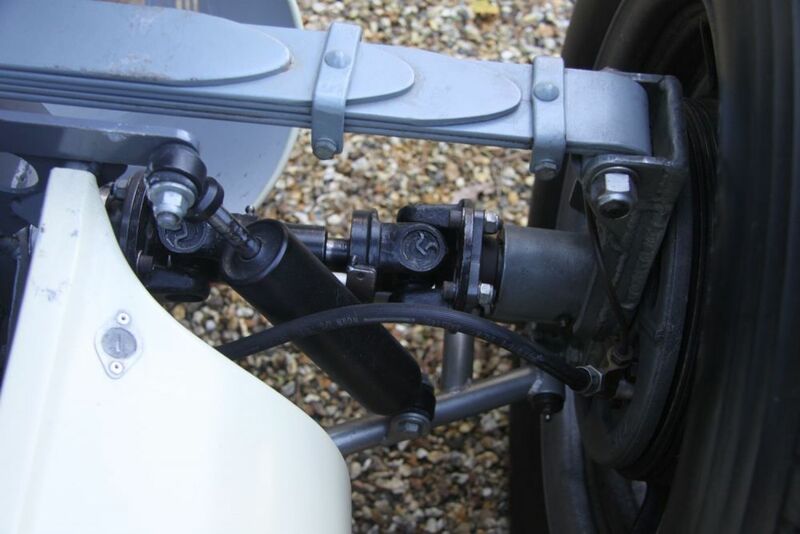 Quoting Mr Garmey’s e-mail on file of 14 April 2015 to the recent UK owner : “To me, a re-fresh is a complete strip down, clean everything, check wheel bearings, steering and brake components – the brake master & wheel cylinders were found to be pitted so they were re-sleeved with stainless inserts and re-machined with new pistons, cups & seals fitted. 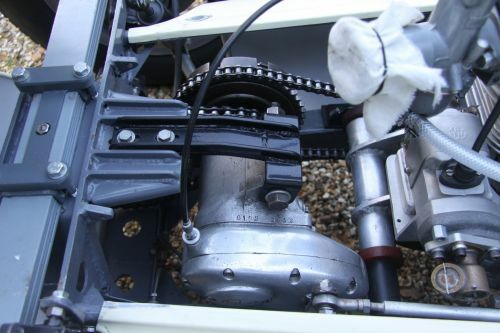 The gearbox was stripped and checked by a mechanic friend who races a Cooper MkVIII Norton, and the engine (rebuilt) as described’. 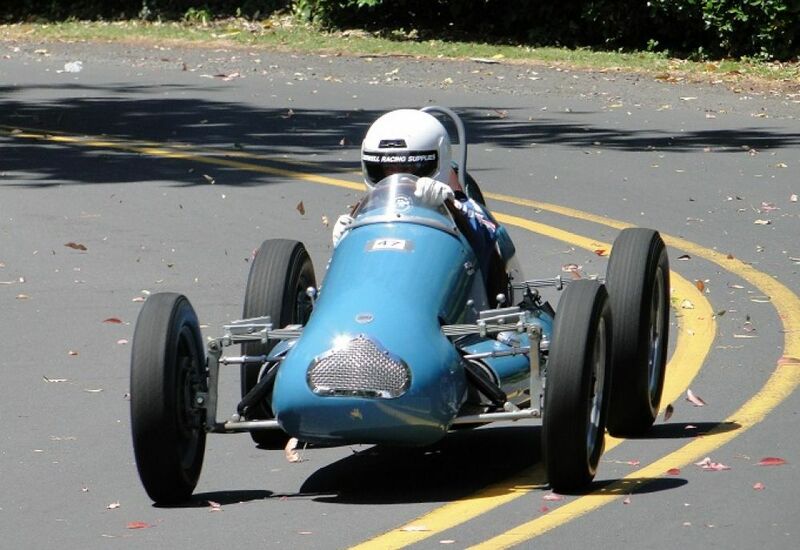 The fresh engine was rebuilt in New Zealand by Dave Gifford in the winter of 2013/14 and has not been run since. 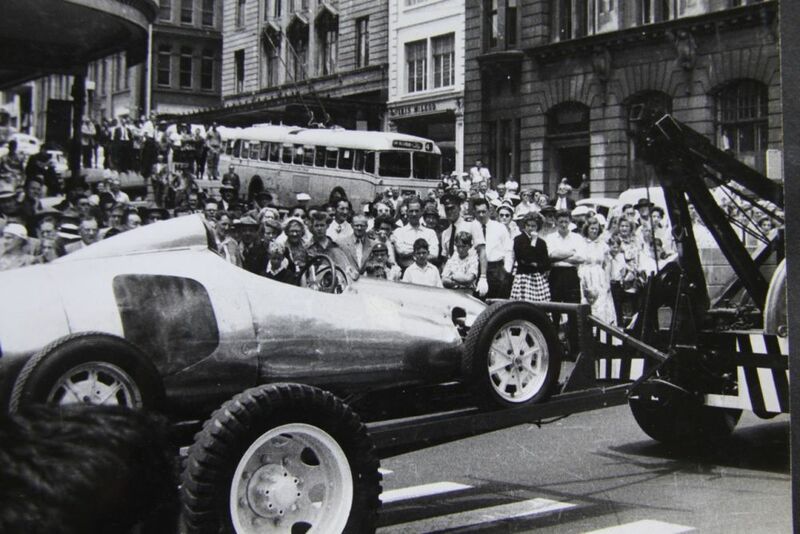 He advised Mr Garmey that all the engine needs is fuel and it will run. 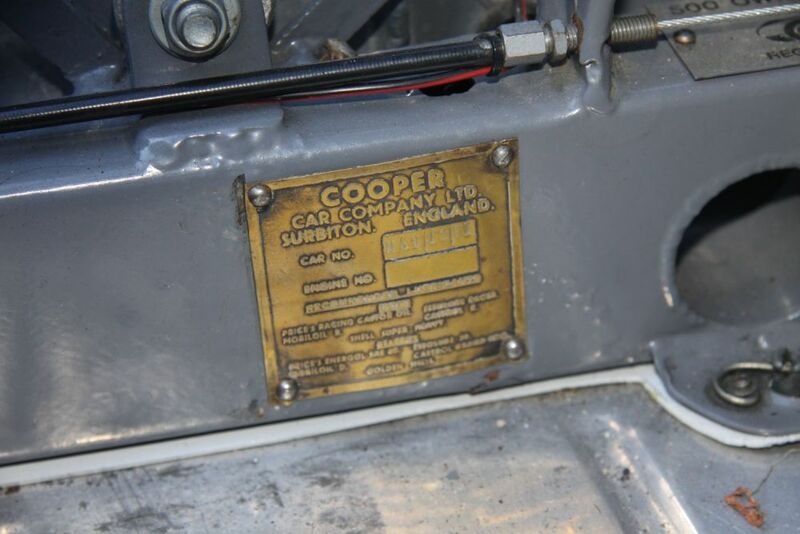 There are detailed instructions on file to start the engine, together with Gifford’s contact details. This year Ian Garmey came over from New Zealand for a month and met up with 500 Owners Association chairman, Nigel Challis, and also the current owner of MkV/12/51 at Silverstone. On 30th July 2016 the car was exhibited at Prescott at the celebration of Cooper’s 70th Anniversary & the Members’ competition day. 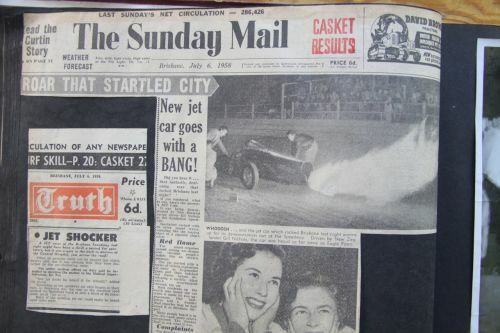 A scrap book with several photographs and press cuttings document the history of MkV/12/51. 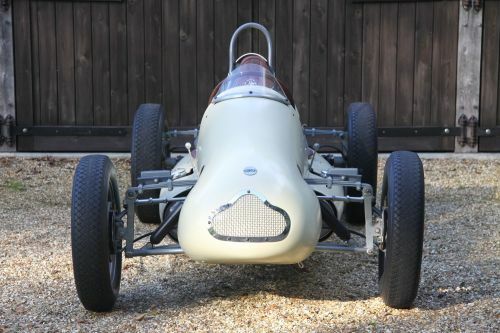 Rebuilt and ready for pre-competition preparation, MkV/12/51 is now seeking a new pilot to take her on to the next chapter of this important Cooper’s history. 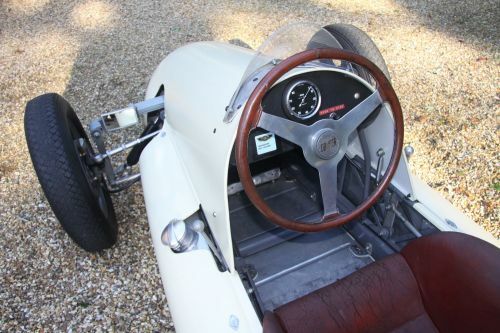 For 1951, the Cooper Mk V (T15) introduced a number of new features. 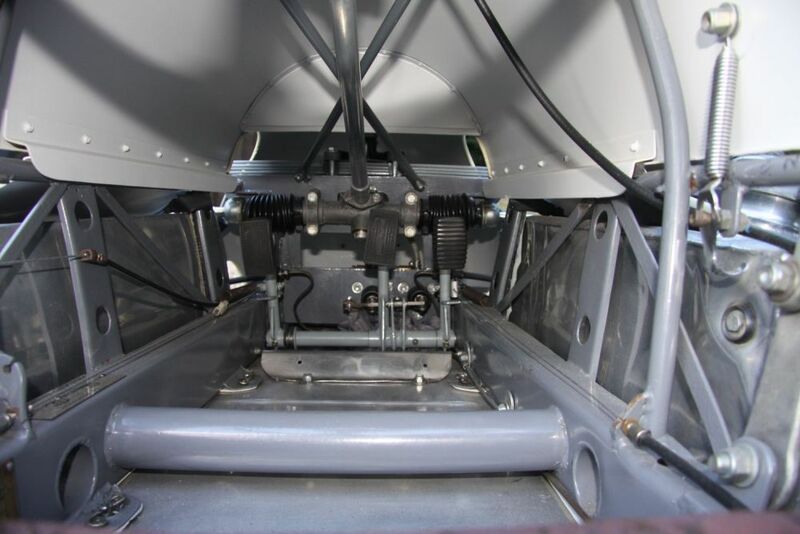 For the first time, the body panels were completely detachable and the upper panels hinged to improve access. 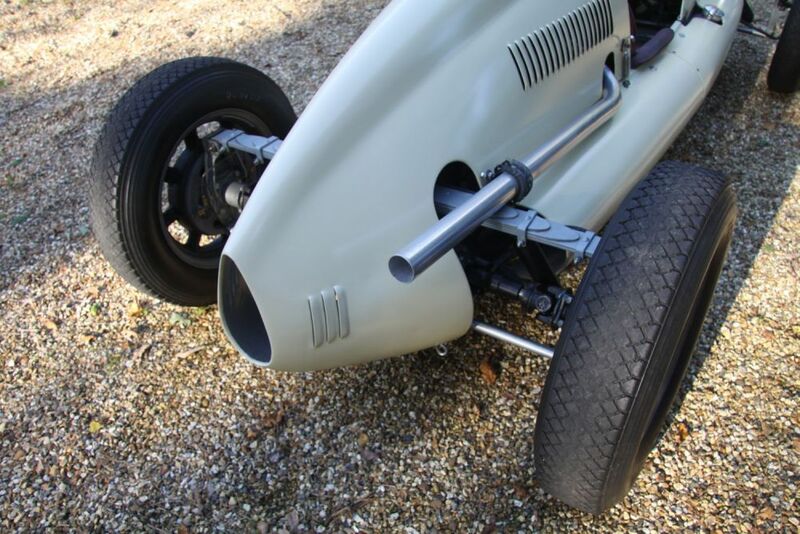 Twin pannier fuel tanks were introduced on either side of the car, and the body shaped changed significantly to accommodate this and to reduce frontal area. 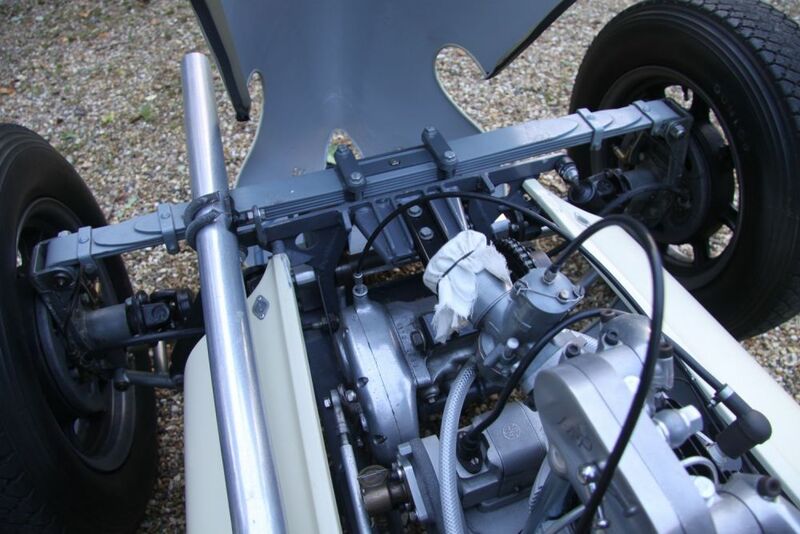 The dummy grille remained but served no real purpose as the cooling duct was removed. Instead, a scoop was added under the cockpit which deflected air by the oil tank (mounted behind the driver seat to the engine. 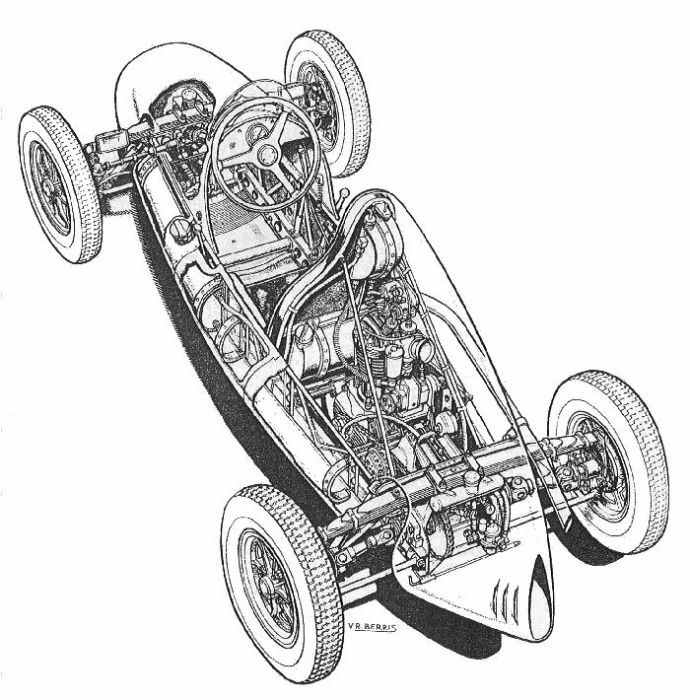 The box section chassis frame remained, in a modified form, with parallel tubes running above and vertical bracing tubes linking the longitudinal members to improve rigidity. 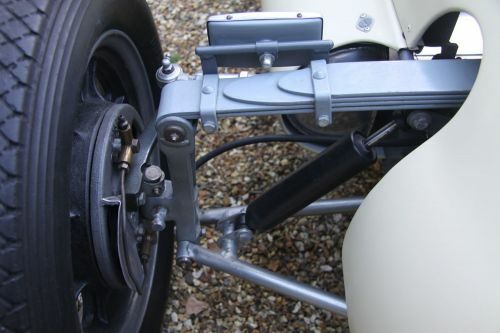 A pump was mounted on the back axle to take fuel up to the small tank behind the drivers head which, in turn, used gravity to feed the carburettor. Newton dampers were used. 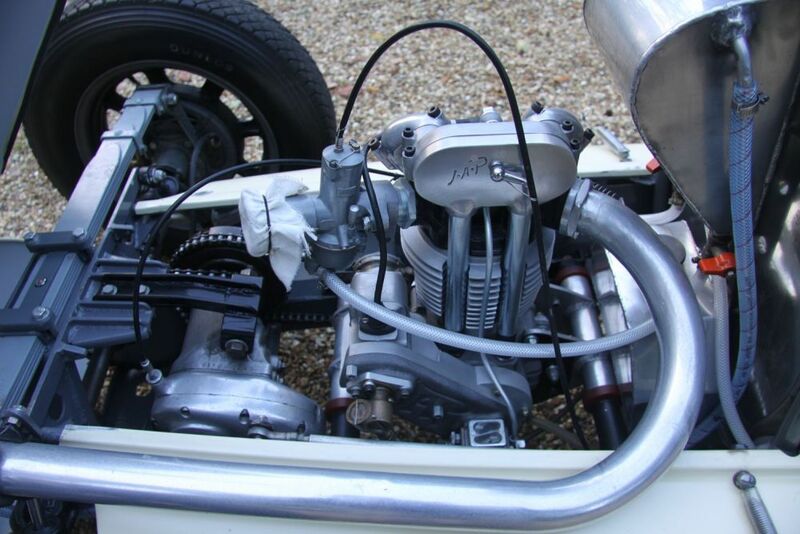 List price was £500 without engine or £582 with a JAP, excluding tax. 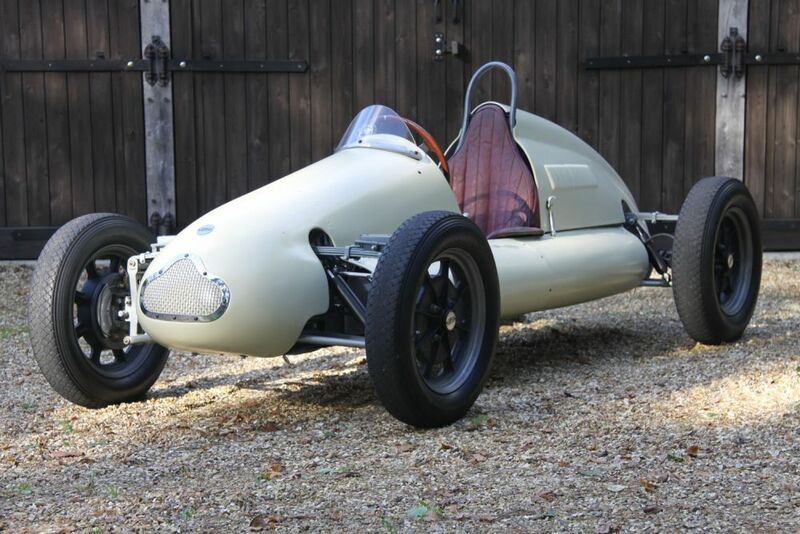 A long chassis version (T16) for 1,000cc and 1,100 engines was also offered and a streamlined body was constructed for record attempts (T17). New customers included Bernie Ecclestone and the semi works team of Ecurie Richmond, with Eric Brandon and Alan Brown driving. The works team drivers were Ken Carter and Bill Whitehouse. 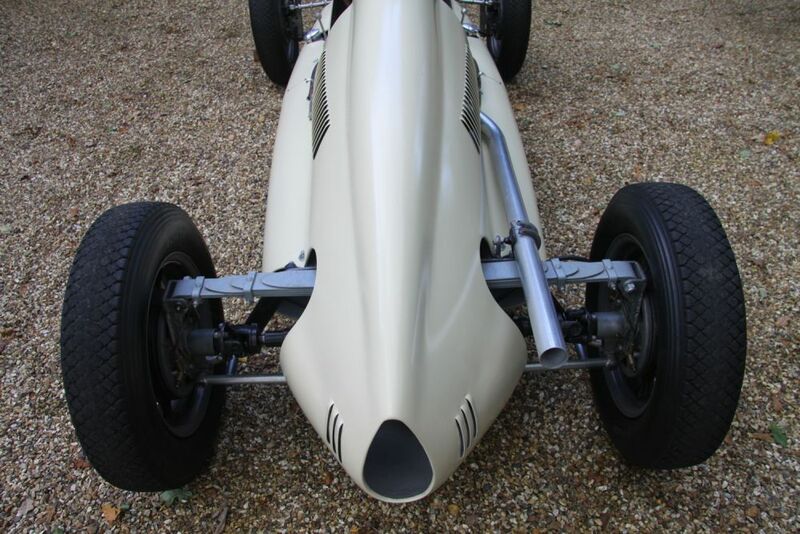 One car was specifically built for Festival of Britain exhibition. 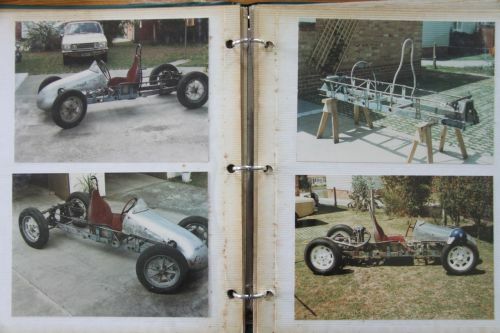 John Cooper was now so busy building cars that he only managed the occasional race. The 1951 season reaped nearly sixty outright victories for Cooper 500s.